First Aid completed with no issues as shown by the green checkmark. Disk First Aid is the name of a disk repair utility that was included or available for download with Mac OS 9.x or earlier. Disk First Aid was able to analyze and repair basic hard drive problems. Disk First Aid was not a full-featured disk repair tool. It concentrated on just the basics: repairing catalogs, extends, and volume bit maps. Disk First Aid was truly the first line of defense, able to correct minor problems. When Disk First Aid was unable to make a repair, which was quite common, third-party disk utility tools could often do the trick. With the advent of OS X, Apple vastly improved on the supplied ability to repair a hard drive and folded the functionality of Disk First Aid into the Disk Utility application. Disk Utility is an all-around workhorse, providing nearly all the tools and features most users need to work with hard drives or disk images. Disk Utility kept the First Aid name and provided the repair service using a tab named First Aid. Within the First Aid, the tab could be found options for verifying a disk without actually performing any type of repair, as well as for actually repairing a selected disk. Because repairing a disk could occasionally lead to a volume no longer working, as was the case when a disk was in such bad shape that the repair process could result in unrecoverable errors, many people would first use the Verify Disk option by itself to see what kind of shape the disk was in. With the advent of OS X El Capitan and the redesign of the Disk Utility app, Apple removed the Verify Disk option. The new First Aid tab performed both the verify and repair in a one-step process. While this may seem a step backward, it's actually a faster repair process, and with the quality of drives improving substantially since the early days of OS X, it's no longer the case that the repair process will often lead to disk errors. Now it happens only rarely, though you still should back up your data before ever performing a disk repair. Verifying Disk Permissions and Repairing Disk Permissions was another feature of First Aid in OS X. System file and folder permissions could become compromised over time because the file permissions were set improperly by an app, app installer, or the end user. Permissions could also become corrupt over time. Just like repairing disks, permissions could be verified, which produced a list of files and folders with their current permissions listed, along with what the correct permissions should be. The list of files with incorrect permissions tended to be so long that most users would simply select the option to repair permissions and never bother to verify them first. Repairing file permissions generally, couldn't cause any problems, and was often touted as a fix for many problems that could ail a Mac. 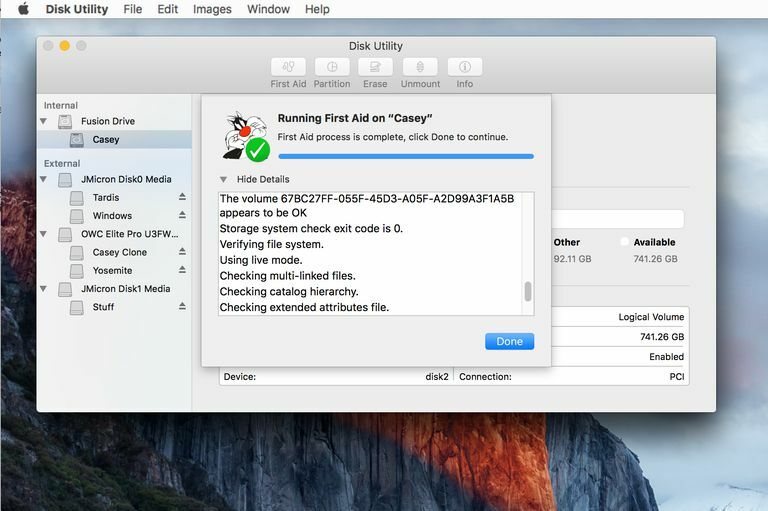 With the introduction of OS X El Capitan, Apple removed the file permissions verification and repair function from the First Aid feature of Disk Utility. Instead, Apple set up a system file and folder protection system that prevents the permissions from being altered, to begin with. Apple also now performs a file and folder permission check/repair as part of any update to OS X or macOS. Disk Utility does a great job of drive repair most of the time, but there are other methods of performing the repair process, especially when you're having problems with your Mac.